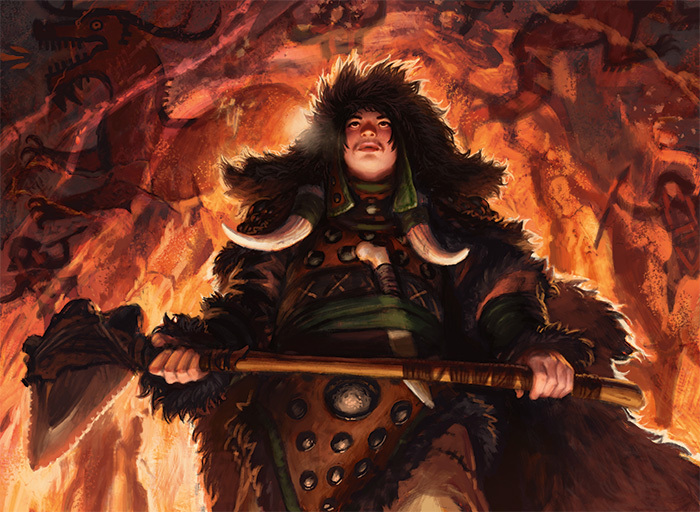 Perhaps you've seen Surrak Dragonclaw, the khan of the Temur clan. Perhaps you've even seen him punch a bear. 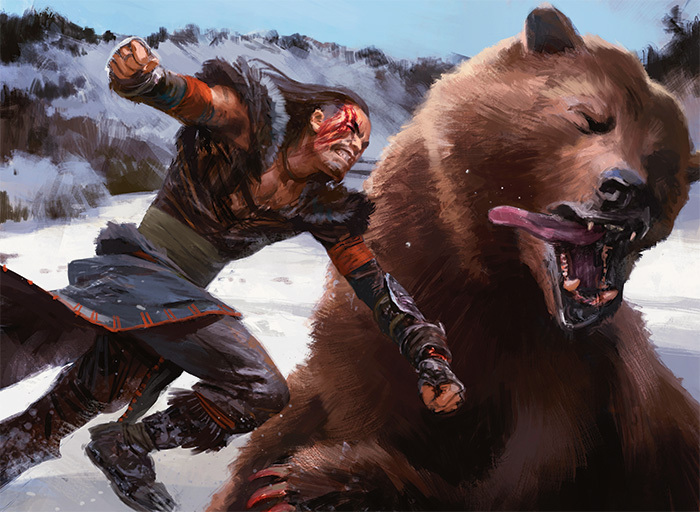 But the Temur aren't all face-smashing and bear-punching. They're also a deeply spiritual people, and Surrak represents that duality of reverent respect for the wilds and utter pragmatism in dealing with them. The youth hesitated at the entrance to the dark cave. He pulled the fur hood closer to his face. The cold air was hungry and the thin wisp of beard offered no protection from its bite. Surrak could see no light within, but a wild scent chased down his nose and smote it with sturdy blows. An atavistic memory roared through his mind. A sound reached from the darkness. Or was it a thought? He didn't know if he had heard anything. But it called him onward. It did not comfort. It spoke of fear. But it also whispered of strength. He took a breath, stepped forward. The close air was heavy with animal scent. He moved with the throb that hammered all around, the great heart of the wild. It seemed as though many voices were chanting in weird harmony. The song grew louder. It wrapped him tighter than his furs. The drumming stopped. Sudden light flared, and he squeezed his eyes tight. The voices rose to a shout. Then silence. He opened his eyes. A fire was burning, somehow, in the middle of the stony floor. No wood fueled its flames. It flickered, orange, blue. Above him rose a vault of rock. Across it, like a river, streamed a line of creatures. Some he recognized: great elk, white wolves, huge bears, even skulking minks. Some were legends: the ancient mammoths and the mighty dragons whose bones still anchored the clan's tents. More still were amazing beasts that had never lived. He had no name for them. They ran across the ceiling, seemingly alive, their bright colors rippling in the firelight. He saw no one. But many openings led from the great hall, and now the strange chant started up again. Look now, young one, it seemed to say, although it held no words. 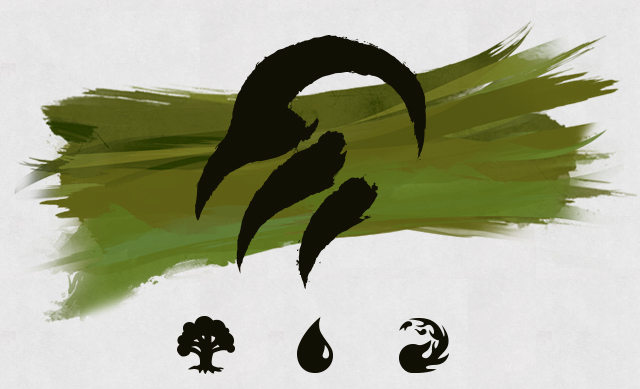 See your destiny, heir of the wilds. The rhythm seemed to soak into him. As if in dream, he dropped supine on the stony floor. The painted parade shimmered above him. A great bear, roaring on its hind legs, stepped from the ceiling. It swung its heavy paws over a tiny-looking human figure that had not been there a moment before. The human was unarmed. The two met, clashed. Then only the human was left. It lifted a double-bladed staff overhead. The vision ended. Surrak's eyes grew heavy, and he slipped into blackness. When he awoke, the cavern was chill and empty. Only faint light from the cave mouth intruded on the dark. The panorama overhead was dim and lifeless. But he still clasped tight the vision of the night. He gathered his fur cloak around himself and stepped into the frozen forest. As Surrak grew, he listened to the inward echoes of the chant and let his spirit point the way. He walked where none had gone. He sought the wildest places. He came upon the paw prints one day as the hidden sun grew high. Each print was as big around as the youth's waist, driven deep into the snow. A rank smell still lingered about them. The beast was near. Surrak stopped and cocked his head to listen. At first, only the susurrus of snow and the thin wind met his ear. He stood motionless, like a stone-pile guide in the woods. Crystals settled on his shoulders. Then he heard a hoarse grunting sound. A heavy form breaking through the ice and shoving aside branches. Not far ahead. He tightened his gloves. Crafted from the hide of some Abzan beast fallen long ago to his clan, they gripped his arms up to the biceps. The claws of wolves thrust from the knuckles. Other than these, Surrak's own bravery and strength were the only weapons he carried. He shouted a challenge. The words were ancient; he did not know their meaning. The Whisperers said the words once were screamed by dragons. Surrak knew only that they were full of fury and power. Then he hurled himself forward. The bear reared up before Surrak. It bawled its own challenge in the tongue of its kind, shaking its head and gaping wide. It was nearly twice his height. Surrak could not check his rush in time. A huge paw smashed into him. It was as though the mountain itself struck. He was tossed into the air. He flew backward and crashed into a tree. Ribs gave way. The breath burst from him. He gasped, half buried in the snow. The creature charged. The ground shook to its bounding gait. Surrak struggled to haul himself to his feet. Too late, he realized he could not avoid the onslaught. Instead, he threw himself to the side as the monstrous creature lunged to crush him in its jaws. A powerful, clawed foot clipped his head. Pain burst in his eye, his brow. His sight was blurred in a film of red. Surrak shook his head, bearlike. He staggered to his feet and put a thick tree trunk to his back. With one rough glove he scrubbed the gore from his face. He could feel shreds of skin flapping. The bear turned to attack again. Surrak set his feet against the bole. The bear gathered itself to charge. Surrak roared and sprang at it, driving with his feet from the tree. His gauntleted fist drove into the bear's face like an axe blow. Stunned, the creature dropped to the snow. Before the bear could rise, Surrak howled again and threw himself on its back. He gripped its shaggy neck with one hand, and hammered on it with the other. He tore off fistfuls of fur as he struck, again and again, while the beast threw its head about and tried to shake him off. Blood spattered the snow. At last, he let go and jumped away, panting and bloodied, to confront his opponent. The two brutes stared at each other. Surrak's remaining eye held the other's gaze and dared it to come at him again. The bear's head hung low, an ear torn, teeth shattered from the savage punch. Finally it dropped its gaze and turned aside. It huffed, shook itself, and slowly moved away. Surrak stood, shouting the chant of triumph, until his enemy was lost to sight. Then he sank to his knees. Surrak returned to the great camp at Karakyk. The right side of his face was raw and ragged, and he could not see from that eye. He carried tufts of brown fur, a claw that had torn loose from the bear's initial charge, and several broken teeth. Silently, he presented the trophies to the clan elders. They acknowledged the gifts and bestowed on Surrak the rights and titles of the grown. Into his hands, The One Who Whispers Twice placed a greatspear tipped with flint and bound in blessed strands. The healers took him and cleansed his wounds. The scars were stark, bone white against his wind-chapped skin, and his right eye was clouded like a winter day. No hair would grow on that side of his face. But Surrak smiled. He bore the marks of a great warrior. From that day, he led clan fighters to hunt both game and foes. At first, his warriors were few, but as he harvested victories, so too did their numbers swell. Soon, only the Dragonclaw and the Hunt Caller counted more blades. The cruel winter loosed its claws, if only slightly. Spring crept into the high passes, and the families dispersed to their hunting grounds. But as the weather grew more gentle, the boldness of the clan's enemies swelled. To Surrak, this season seemed worse than many previous years. Raiding parties from other clans, and especially the hated Sultai, continually harried the camps and drove away the game. The Temur replied in force. 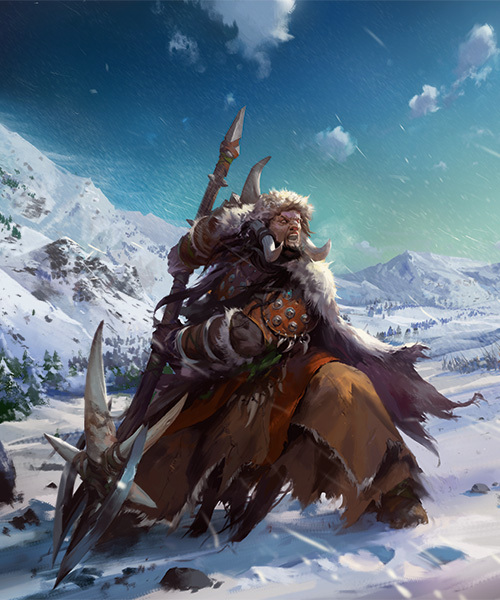 Surrak and his kin spent more days in pursuit of two-legged prey than in the hunt for food. His people grew weary and drawn. To their great shame, some began to drop away from the group, too weak to go farther. The ragged party continued its trek. It moved to the lower slopes, where food might be easier to find. But the land was bare, befouled by the passage of many feet—and things without feet. Surrak scowled and urged his band in pursuit of the raiders. In a trampled clearing, they caught up to their prey: a huge group of scavengers under the banner of a trio of snake-folk, and a train of the shambling dead. The Temur spat curses as they recognized the emaciated forms of their own clansfolk, lost to hunger and disease. The hunting party was badly outnumbered. 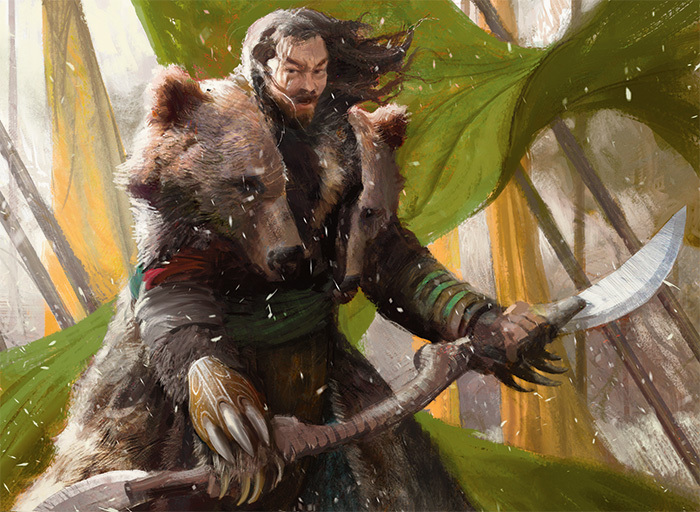 But Temur strength does not come from mere numbers. The fury of the wild erupted from the warriors' breasts, and they fell upon their foes. Claws and axes slashed flesh. Their enemies hurled vile magic and spat venom. Although the stalwart mountain folk slew many, more of them began to fall. Surrak had led the charge. He found himself surrounded and jabbed with his spear and clubbed with his fist. Dozens lay dead about him. Wounds gaped on his body. But he would take down as many as he could before he joined the ancestors. Suddenly, a roar shattered the clash of battle. The earth shook. From the nearby forest rushed a hulking, shaggy form. 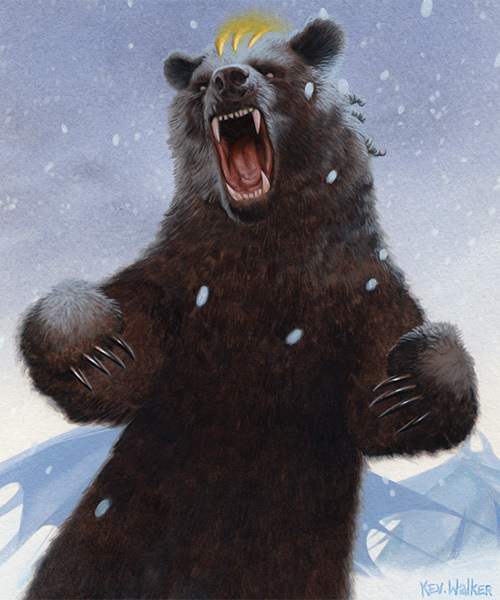 The cave bear crashed into the ranks of the Sultai, ripping apart the gaunt zombies and bowling over the astonished humans. It forced a path straight through to Surrak. Then it turned and began to rip into another swath of enemies. Surrak laughed in welcome for his old challenger, his new ally. He waded again into the fight. His companions hesitated only a moment, then redoubled their efforts. The Sultai fell back in terror and amazement. Many broke and ran, leaving their serpent masters undefended. With a massed shout, the Temur overwhelmed the rest. The battle was won, the enemy ruined. Their foulness would not soon stain the mountains again. Surrak leaned on his spear shaft, breathing hard. He then felt the pain of his many injuries. He heard a heavy, grunting groan behind him and turned. Splayed on the ground, the mighty bear rolled its head in anguish. Surrak saw the shafts of barbed Sultai arrows sunk in its flanks. Black smears of venom mingled with the dark blood. The bear turned its eyes toward Surrak. In them he saw a plea. He knew his duty. He bent, removed a gauntlet, and laid his hand on its muzzle. He spoke the ancient chant that sent the fallen to the ancestors. Then he stood and drove his spear through the beast's skull. He Who Whispers Twice spoke the invocation that marked Surrak as the First Father of the Temur. About Surrak's shoulders he draped a cloak of bearskin: the preserved hide of the clan's defender. Surrak drew on new gauntlets, crafted from the great beast's paws. He lifted the ancestral Dragonclaw overhead. He and the bear and the clan were one.